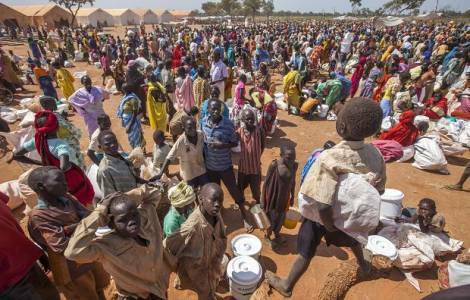 AFRICA/SUDAN - Archbishop of Khartoum: "Stop ethnic clashes among South Sudanese in refugee camps"
Khartoum (Agenzia Fides) - "We are trying to make people live in peace because people are still fighting even in the camps", said His Exc. Mgr. Michael Didi Adgum Mangoria, Archbishop of Khartoum, referring to the situation of nine refugee camps hosting South Sudanese refugees in the capital of Sudan. The civil war in South Sudan that broke out in December 2013 has forced millions to flee, also because the conflict immediately took on an ethnic dimension that is reflected also in the camps where refugees are welcomed. "Each ethnic community are put separately but they still meet even at the bore holes and these are the places where two or three people quarrel and before you know it the fight has escalated and the whole community is involved", explains Mgr. Mangoria. The Archbishop reiterated that he is trying to do his best to deal with the problem of tribalism in refugee camps. "I told the priest that if I see or hear any of them trying to encourage tribal divisions by perhaps saying these are my people, then I will suspend him", says Mgr. Mangoria. "This is meant to send the message that tribalism is very evil and should not be tolerated". The Archbishop was saddened when he learned that in one of the camps, several ethnic communities decided to build small huts to gather for worship based on their tribal affiliations. He therefore told them that "if you do not create a common place of prayer for all communities, I will not send priests for religious services". Mgr. Mangoria finally pointed out that politicians are fueling tribalism to promote their interests. "Continue praying for us as we pray for you so that one day we realize the hope that our political leaders will stop playing with the emotions of the people by fuelling tribal animosities so that we can enjoy the real peace", he concluded.